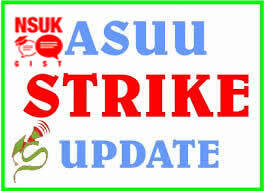 Having exhausted the 3-week ultimatum given to the management of Nasarawa State University, Keffi and the state government to meet its demand, the Academic Staff Union of Universities (ASUU) NSUK Chapter on Monday 7th March, 2016 declared a “comprehensive, total and indefinite strike that will continue until all issues raised are resolved”. In a press release at the end of the meeting held at the Assembly Hall of the University, the Union ordered that “no lecture, no supervision, no field trip/workshop, no defense whether internal or external, no weekend lecture, no sub degree lecture, no practical, no conference on campus, no external examination, no ceremonial activity such as convocation and matriculation involving academic staff and academic staff in library and ICT will not render services”. The release also states that “no statutory meetings at all levels- senate, faculty, department, and subcommittee” involving members should hold. It directed “members who holding positions as Council members, deans, head of department" not to attend statutory meetings called by the administration. ASUU also instructed members not to see students, supervise students or perform any engagement whether official or private with students of all cadres. The Union is demanding payment of backlog of Earned Allowances and the repositioning of the university’s infrastructure.